We’ve just launched a book about what you should be aware of when choosing a timesheet reporting solution. 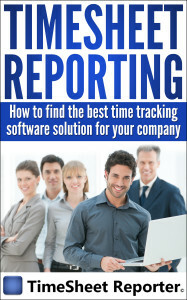 “This book contains proven steps and strategies on how you can manage your timesheet reporting through a software solution that is affordable, effective, and simple to use. Many companies have utilized these timesheet reporting software solutions because of their proven effectiveness in simplifying the timesheet reporting process from registering time to preparing reports and client invoices.